The five second test is a simple usability test that helps you measure the effectiveness of your user interfaces. 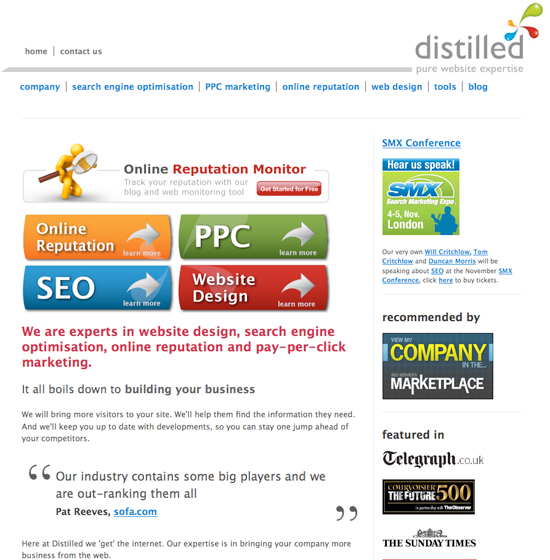 Distilled have been using this tool to discover what users notice most about our website. The tool works by flashing up a screen shot of the particular web page for 5 seconds-(can you see where they got their name from)? After the page is viewed a form appears which has five spaces for the user to simply list the things they remember. Some people used these spaces to list the things they remembered, others to give in-depth advice or constructive criticism and others to simply offer up random abuse ... nice. If you are a loyal subject of Distilled, you many have noticed that we have been implementing some minor changes to the Distilled 'Home' and 'Contact' page recently. These changes were spurred on as a result of the the interesting things people had said in our test. Just a few months of using the tool gathered a considerable amount of data for both pages. We then set about analysing the findings to try and discover how these pages could be improved. 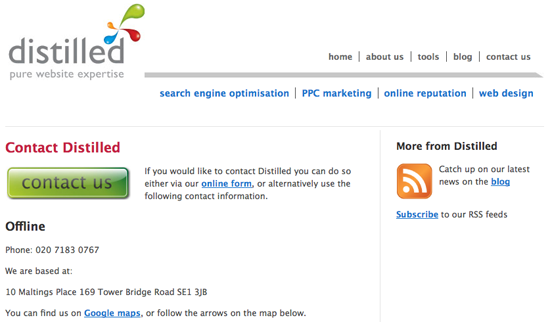 Below is what the Distilled home page looked like when it was being tested. For this page we received lots of positive feedback and a few suggestions. These regarded the unusual right hand positioning of the logo and the continuation of our brand colours further down the page. The feedback also highlighted a lot of repetition in people's responses. This is a good sign because it means a lot of people were noticing the right things. I have collated my findings in a bar graph in order to make differences in figures more readily recognisable. At this point 31 people have taken the test. 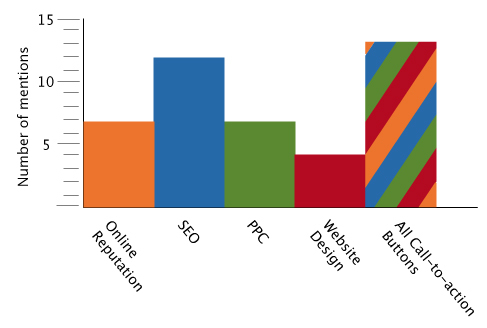 Bar graph Analysis - The graph shows clearly that people are drawn to the call-to-action buttons. This is great; they are achieving their purpose. 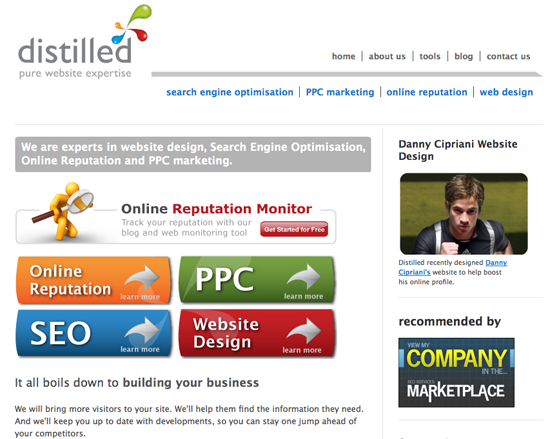 SEO has been noted more than the other services we offer. One theory I have about this is that usability testing tools fit closely with optimising websites, so it's natural that more people who are aware of SEO will be taking the test. SEO is certainly not designed to stand out any more than the other service call-to-actions. The unusual right-hand positioning of the logo caused some comment. The right hand alignment of most of the elements within the logo led to this positioning initially. As the amount of services Distilled offers increased the menu was forced to split awkwardly in two halves; the new design has solved both the logo and menu problem, whilst allowing space for any more services should Distilled expand its talents further. The new design also continues the Distilled colours further down the page, therefore continuing the brand and highlighting more clearly what we do as a company at the top of the website. - too large RSS feed - GIANT rss button - RSS button again - RSS RSS RSS OKAY!? - giant rss feed icon - Gigantic RSS icon - Huge Contact Us Button - Not enough content to make me want to click on either huge thing. So it was clear people found both the RSS feed and the 'contact us' button overly large. Both call to action buttons have been made smaller and more content has been included next to the RSS feed. Hopefully, this content will help to make people trust the icon and want to click on it more. One of the downsides of the 'Five Second Test' is the minimal amount of information that is received. It is certainly not the best tool if you are after detailed explanations of peoples' thoughts. If, however, you are looking for just sheer numbers to analyse then this tool is great; it soon becomes clear after just a few feedback responses what people are noticing most frequently and consequently what they are most likely to click on. Do people know what your company is called? Do they notice your logo? Is it clear what you do? Are your Call-to-actions noticed? The five second test is definitely a tool worth trying out. 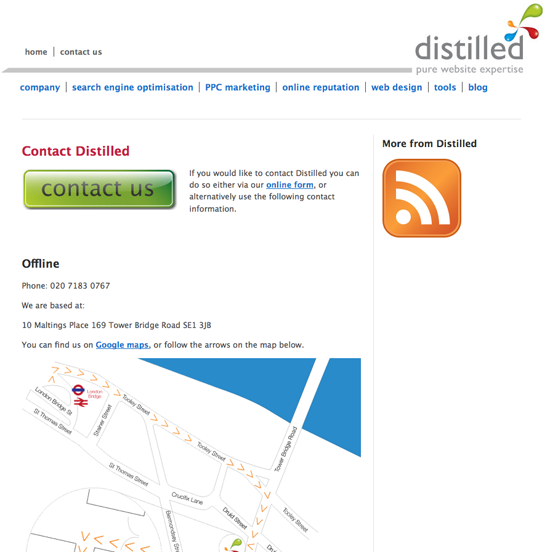 Distilled will continue to use this tool in an effort to ensure our website stays user friendly and easily accessible.